Posted by David Caudel on Tuesday, July 3, 2018 in News. Our first four-week, pre-employment camp for teens on the spectrum, called the Workforce Readiness and Preparation camp, or simply WRaP, finished at the end of June. 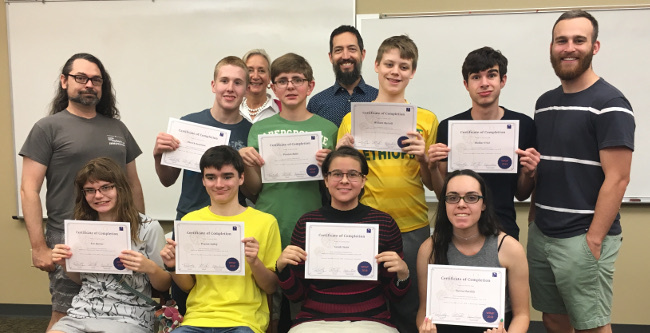 This WRaP was held at Currey Ingram Academy, with two of their teachers, Scott Field and Trevor McKey, serving as coaches, under the direction of Jane Hannah and Joy Young and with additional support from Stephanie Diaconis of Specialisterne, the Danish company that first pioneered the 4-week program. Field, McKey, and Young flew to New Jersey earlier this year to train for this camp under the guidance of Dianconis. In the coming years, we’re planning running this camp on an annual basis, with the help of Currey Ingram Academy, to service teens on the spectrum in the Nashville Metro area. Hi, we have a son entering 8th grade and and we live in NY close to New Jersey and CT. Would love the Nashville model here or would consider sending our son. He is HFA, Aspergers. Any leads for us in our neck of the woods? We’re creating an online course on how to run a WRaP camp, and by early next year we’re planning on launching it. Hopefully within the next few years we’ll be able to export these camps all over the country.